This enhancement is an improved price list from Elliott’s original design. It provides an easier way to read a customer(s) price list. You can locate an item price for a customer more quickly, and this list can be sent to a customer(s) with more concise information. 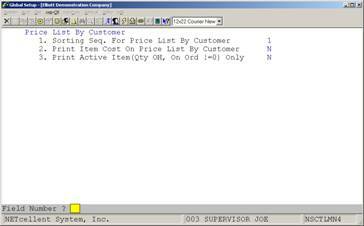 This enhanced list can be sorted by Item Number, Product Category, User Defined Code, and Warehouse Location, etc. Figure 4G.1 shows the setup screen for Price List by Customer. 1. Select Distribution form the Elliott Main Menu. 2. Select Customer order processing. 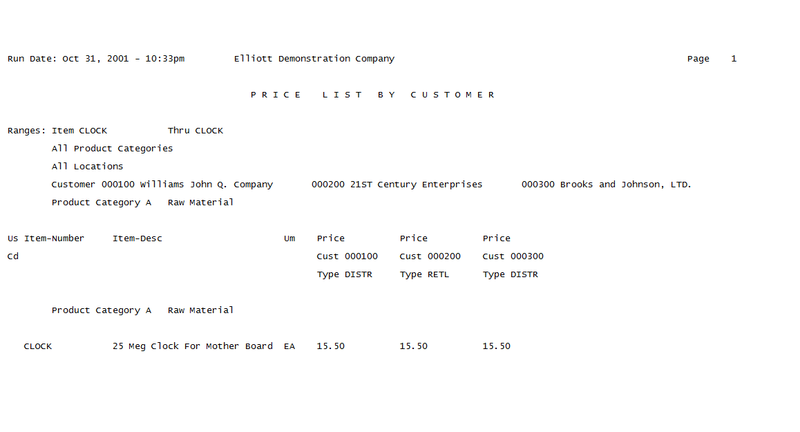 Example of how to generate the Price List by Customer. Internal price list showing the pricing information on a specific item for three different customers. This enhancement gives users the ability to print one or multiple COD tags for an order number. Note: This enhancement only prints a COD tag for order type "O" or "I". The enhancement has the capability of printing either the customer number, plus the order number plus the box number as the alternate control number, or the customer number plus the invoice number plus the box number as the alternate control number. 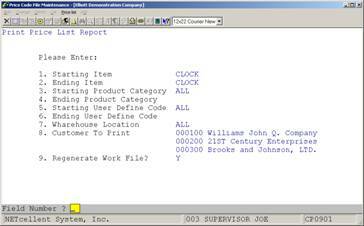 This enhancement allows users to print COD tags under two environments. One environment is the one-step COD tag. This is the case where the order is taken, a picking ticket is printed, all items are picked and ready to be shipped, and finally COD tags are selected to be printed for warehouse. The disadvantage of this environment is that the total amount is not saved, freight amount has not been determined, and the invoice number is not available. 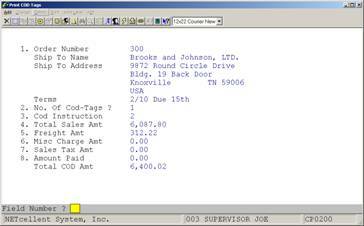 Under this environment, the user cannot use the invoice number as part of the alternate control number since no invoice number exists. The enhancement has the capability of printing the UPS shipper number. 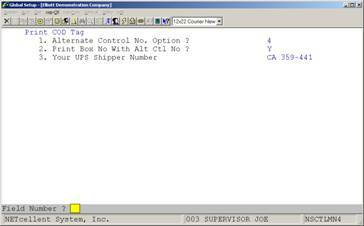 In order for this to be done, the user must set the UPS shipper number in the Global Setup. 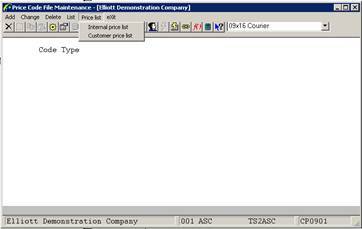 If the order is not selected for billing, this enhancement will calculate the total sales amount and sales tax amount. The user can override these amounts. If the order is selected for billing or the order invoice is printed, then total sales, freight, miscellaneous, and sales tax amounts are available. 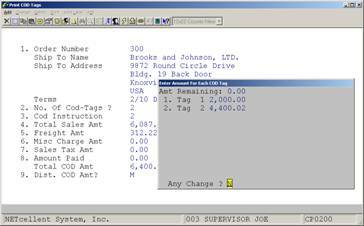 The enhancement will display these amounts, but the user cannot override them. The enhancement will calculate the total COD amount after all amounts are calculated. The user can enter how many tags are to be printed. Next, the user enters if the payment should be cash only or not. Finally, the user must decide whether the total COD amount is to be distributed or not distributed among the COD tags. This enhancement provides protection for orders that are not COD's. If the terms code description is not "COD" or "C.O.D. ", then a warning message will appear asking if the user wants to continue. If the answer is "yes", the user can then enter the rest of the information. If the answer is "no", then the user can select another order number. For cash-only orders, the enhancement will mark the cash-only box on the COD ticket. This box will be marked when the user answers "yes" for the question "Cash Only" or when the terms code description includes the word "CASH" or "Cash". If the box is not marked, the instruction will be "Company Check OK". Figure 4H.1 shows the setup screen for Printing COD Tags. 1. Alternate Control No. Option? This flag is very important. This information will be used internally to reference back to the order. When you receive the check from UPS, it will have this alternate control Number which can be used to determine what order it was for. There are 5 options: 1 = Cust No, 2 = Order Number, 3 = Invoice Number, 4 = Cust Number + Order Number, & 5 = Customer Number + Invoice Number. 2. Print Box No. With Alternate Control Number? If you answer “Y” to this question, the system will print box numbers with the alternate control number. Enter your UPS shipper number. This information will print on the COD tag. The user has two options of applying the total COD amount. The first option is to print only 1 tag, Field 2. This will print the total COD amount on one COD tag and as a result, 1 COD tag per order. Field 3: Determines how COD is to be paid. 1. N = No Distribution. Total amount goes to 1 tag. 2. M = Manually Manually distribute the COD amt. to the number of tags printed. 3. E = Dist. Evenly System will distribute COD amt. evenly to the number of tags. If M=Manually is selected, a window will pop up and the user can enter an amount for each COD tag. After an amount is entered, the projected total COD amount remaining will be displayed. See figure next page. Sign in with NETcellent Systems, Inc.
How Do I Find The Workstation That's Infected with The Crypto Ransom Ware? What Do I Do When My Anti-virus Software Reports Elliott EXE File as a Virus? "We can't verify who created this file. Are you sure you want to run this file?" 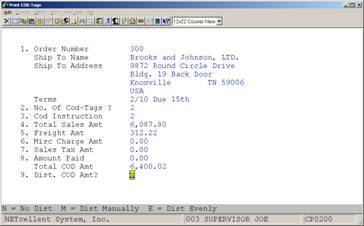 Is Dot Matrix Printer Still Supported in Elliott with Windows 10? Should I Install the 32-bit or 64-bit Outlook/Office? Why Do I Exceed Elliott User License Count When There are No or Very Few Users in Elliott? What Causes Load Error 198? Does Elliott Support Desktop Virtualization? Why Does the User List Function Take Forever to Bring Up? What Causes "File Table Exceed Limit" Error? Is There a Way to Create and Distribute Elliott Printer Configurations? What Are "COBOL Only" or "User Defined" Event Actions? Can We Use Them in Any Way? How to Purge WSORDHDR.BTR and WSORDLIN.BTR files? Does Elliott Support Windows 10? How Do I Limit the Companies for Users? Can I Use Elliott for Sales, Telemarketing and CRM Purposes? Can You Explain How Elliott Stores Serial Numbers in Its Database? Which Anti-Virus Software Do You Recommend to Installing on the Elliott ERP Server? What Information Is Stored in System 12 Months Table (SY12MONS)? Elliott Telephony Integration - How to Call through My Telephone Set from eContact? How Can I Find Out About New Elliott Events Added or Changed Lately? Received Message "Elliott was not completely closed or it was not completely started"